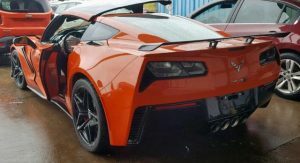 The 2019 Chevrolet Corvette ZR1 hasn’t been on the streets of the U.S. for all that long, and already one popped up for sale on Copart. Unfortunately, it’s in a very sorry state, but that didn’t deter someone from buying it. 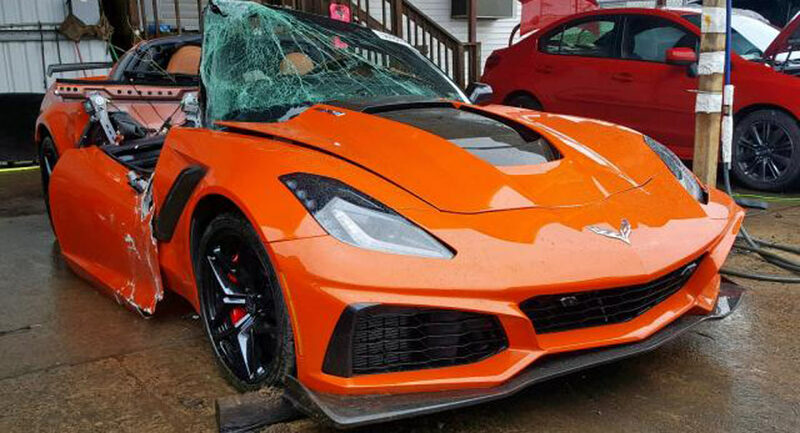 This particular orange Corvette ZR1 is located in Philadelphia, and while no details have been given about the accident that made it look like this, the listing does confirm that it is accompanied by a salvage title. In terms of the damage sustained to the car, it is difficult to look at. At the front, the bumper has been scratched and bent but doesn’t look too bad. 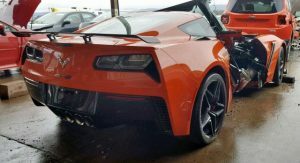 Sadly, things get much worse as you glance down the sides of the ultimate C7 Corvette. The passenger side door has been ripped from the car and the windshield has been almost entirely torn off. 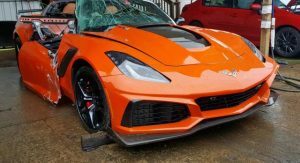 It is possible that much damage was caused by responding authorities trying to remove an injured passenger from the Corvette. 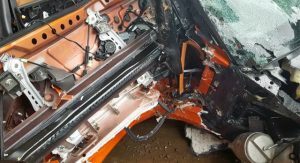 It is also possible the vehicle suffered a high-speed impact to the passenger side. 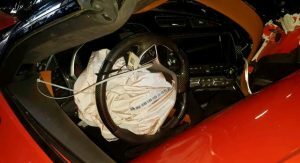 What we can say for sure is that there’s virtually no chance this Corvette will be repaired and return to the streets. 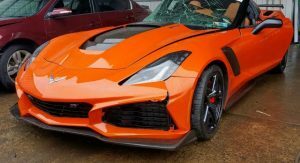 Instead, it is far more likely that the person who bought it will try and sell off some of its most valuable parts or maybe use them in another ‘Vette or a pet project. 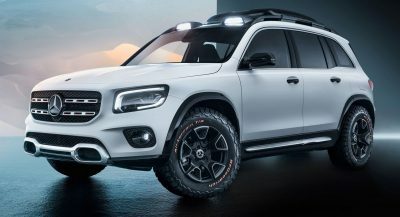 One, and probably the most important, part of the car that might be salvageable is the 750 HP supercharged 6.2-liter V8. 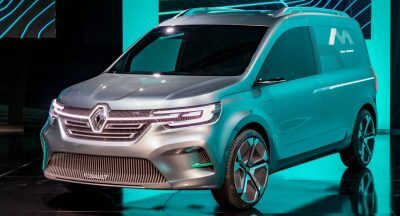 It doesn’t appear to have suffered any damage (at least cosmetically) and could prove perfect for something like an insane engine swap. 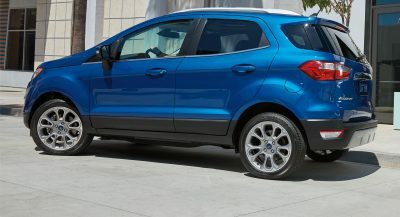 The transmission may also be recoverable and both it and the engine only have 1726 miles (2777 km) on them. Pull the motor and crush the rest. .
Upholstery, interior generally, wheels, brakes, lights, undamaged panel. 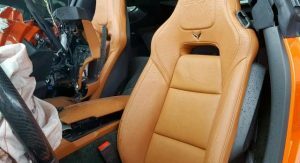 The are potentially 10s of thousands of dollars of spares there – particularly as the cost of NEW is so high for repair work. Pretty much same for most vehicles but the exotics are just that little bit more ludicrous! 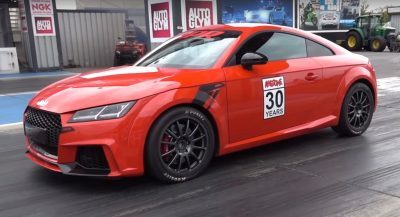 Pretty much same for most vehicles but the exotics are just that little bit more ludicrous – whole car from new parts or “best quality 2nds” can be 5 times or more than showroom. Government enquiries have proven this with mainstream makers just to ask makers – WHY ? Yes yes we all know this,,I really didn’t feel like listing every single part that can be salvaged.. I responded to your rubbish throw away comment. Maybe you don’t understand sarcasm, ,,you need to relax..
What? Shoot yourself in your foot, while your foot is in your mouth! Airbags didn’t seem to deploy, thousands of bucks right there. Head unit for sound? Check. Big honking brakes would work well on ANY GM “project” vehicle. Surely you are not a tinkerer, and do not know the value of such a modern vehicle, I assure you that this Vette is a treasure trove! Looks like a typical part out? Slow news day. love that color. I wonder what they paid for that? 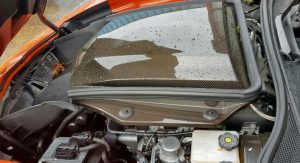 I guess the engine is good, parts of the rear look OK, obviously cant see underneath though. Looks like someone turned off the traction control thereby auto enabling the power pole finder. It will buff out . Dontcha think that even with everything OFF, it’s driver lack of skill? I do. I turned everything off in Huracan RWD and went crazy in rain-slicked roads. But, I know how to drive. Oh yes it’s the drivers lack of skill/experience. 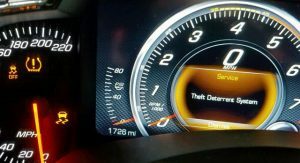 I was pointing out the many settings the driver needed to turn off in the traction control management system on the Vette to get to where the zr1 has TC and stability control fully off. The Author of this article is ultra-ignorant! Cars like this and even in worse shape are repaired and on the road! People marry 2 or 3 wrecks toegether all the time. All this “we know there is no way it will drive” statements by brad are sickening? How do you know this brad? Is the A pillar different.than base model? Let me give you a scenario- its gonna go to Europe where they dont have salvage titles, the owner will get a new european title for it that will not indicate any accident. Then it will go to Eastern Europe where labor is dirt cheap and it will be repaired there and later sold…. 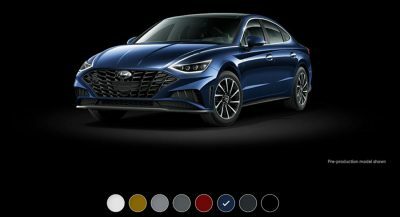 Previous PostPrevious Could Genesis Be Working On A High-Performance G70 After All? Next PostNext Will Toyota Ever Launch A Convertible Supra?